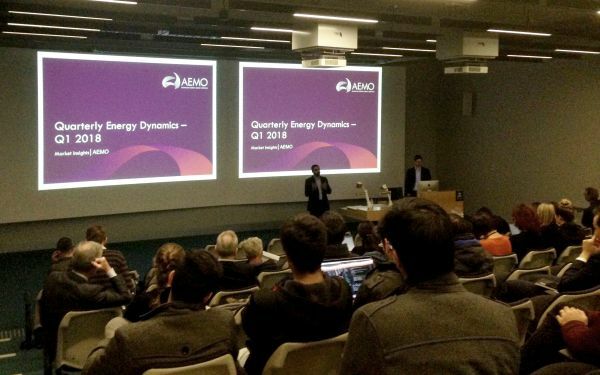 The AEMO Quarterly Dynamics report was recently presented to a packed lecture theatre at the University of Melbourne. On a quarterly basis, AEMO undertakes analysis of energy market dynamics, highlighting trends and outcomes experienced by the NEM and the east coast gas markets. At this AEMO Quarterly Dynamics seminar, Farhad Billimoria and Dr Jonathan Myrtle outlined the findings of their latest Q1 2018 report. The sold out seminar included audience representatives from various parts of the energy sector, including energy professionals within commercial and government agencies, masters and PhD students, as well as general community members concerned with energy issues. The AEMO seminar was held on 3rd July, and was hosted by the Melbourne Energy Institute.